If you do not have the time to travel to our Training Centre, do not want an on-site course, or just want to focus on a particular feature or area of your software, we now also offer LIVE one to one Online Training. This is delivered by our trainers at a time that suits you via the acclaimed GoToMeeting system (using the Internet and a telephone connection or computer headset). During the session you will actually use the software under the guidance of our trainer, who will answer any questions you have. This way you can achieve what you need from a session dropped into your busy schedule, without even leaving the office (or home) and with no travel costs. Overview – a 90 minute session that is designed to introduce a new user to all the major features of the product, to enable them to make the most of it from day 1. We can also provide hands on training for groups of up to 3, contact us on +44 (0) 203 695 7810 for further details. For larger groups we can deliver presentation style training, again, contact us on +44 (0) 203 695 7810 for further details. Select the ‘Book it’ link next to the session you want, to put it into your basket, repeat for multiple sessions, then proceed to Checkout, where you will be asked for your details and will get the chance to enter a preferred date and time for the session(s). We will subsequently contact you to confirm your booking or to arrange a different date and time if the one you selected is not available. Call us on +44 (0) 203 695 7810 to arrange your booking for a date and time convenient to you. These are led by the ThermoScientific GRAMS team. They consist of a live presentation followed by an open questions and answers session (see more details here or download the 2014/2015 training schedule). Advance payment is required for all our Online Training sessions. 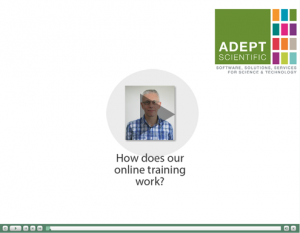 All Online Training sessions are usually delivered in the English, German, Swedish or Norwegian (you can choose). Bookings are welcome from anywhere in the world, but please be aware that, currently, sessions are usually arranged for times equivalent to UK daytime office hours. An Internet connection with a decent speed is essential. A separate voice telephone connection can be used for the audio (your telephone provider’s normal call charges will apply), or VoIP can be used via the Internet connection using a computer headset (free of charge). Delivered directly to your desk – no need to travel, so no associated costs. Short, affordable sessions focus on specific aspects of your choice. Sessions are LIVE, letting you interact with the trainer while actually using the software. In the absence of an existing schedule, sessions can be arranged at a time to suit you and our trainer.